1)What are the exposed traces that make half the switches called in EE lingo? 2)What are the oblong dark forms i can see on the pcb? 3)Is there any use whatsoever for the diode that were added to later (PAL) revisions? 4)Will a PAL controller work in a NSTC unit? Will a NTSC controller work in a PAL unit? I know scandinavian controllers won't work in german 4-scores, but let's assume no middleman peripherals. My understanding is that some PAL units are intercompatible with US ones and vice versa, and then the balkanization was to fragment the market within PAL-land. Replacing all the diodes with shorts or open circuit (depending) should change it to match the US convention. Aha - So it's basically the same material as the carbon tracks inside a potentiometer, then. Is there a name to the coating that holds them in place? I Brought out my multimeter. They measure 45k, though sometimes the traces pass two resistor tracks on their way to VDD, = 90k. My understanding is that these values are noncritical. Is there a reason for the double tracks in series? This schematic looks a bit tidier: https://projects.drogon.net/wp-content/ ... ematic.png -maybe the schematic is omitting/implying something? Is there a name to the coating that holds them in place? I think it's the same "resist" that covers the rest of the PCB ... but that doesn't explain how it works in potentiometers. Apparently this technology is specifically called a "carbon printed resistor". My understanding is that these values are noncritical. Is there a reason for the double tracks in series? but that doesn't explain how it works in potentiometers. a completely uneducated guess is that the constraints of the capsule + pressure of the wiper is enough to hold it in place in a potentiometer. Another question: Is there a name for the type of female wire contacts inside the male plug? I can only see 5 contacts in the plug, even if it has 7 plastic shafts; which make sense since there's no wire for d3 and d4. I have to check if that's the case for my extension cable aswell when i get back home. Generically, "contacts". Not very satisfying of an answer. NES-004 controller (North America) doesn't work on NESE-001 (NES-ESP-2, Spain). 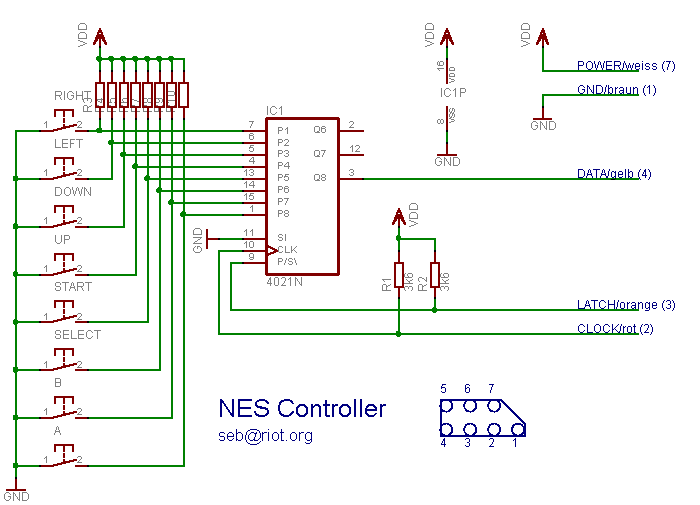 NES-004E controller does work on both NES-001 and NESE-001. SNS-005 controller (SNES North America), with appropriate adapter, works OK on both NES-001 and NESE-001. Most NES extension cables seem to have all 7 lines, I did find one type that only had 5 though. This interactive circuit was done by me this week for better understanding the internals of the controller. Hopefully I got most right The attached .txt can be imported in http://www.falstad.com/circuit/circuitjs.html. Since this is my first post: Hi to all! US NES and Scandinavian NES uses the same NES-004 controllers, and can take any NES controllers. I think only certain PAL-B NES systems like the German and Spanish ones (and their Fourscores apparently) like already mentioned requires the NES-004E controllers.